Each week, I provide a new recipe for you to try at home. I'll post the same recipe on my Facebook page (click here). Please leave a comment on Facebook to tell me what you think of it. Click here for a printable version of this week's recipe. There are many variations of an optimal healthy plate. They can be useful to give you a visual of what you aiming for. This will be personalised for you during your consultation, depending on your health situation. 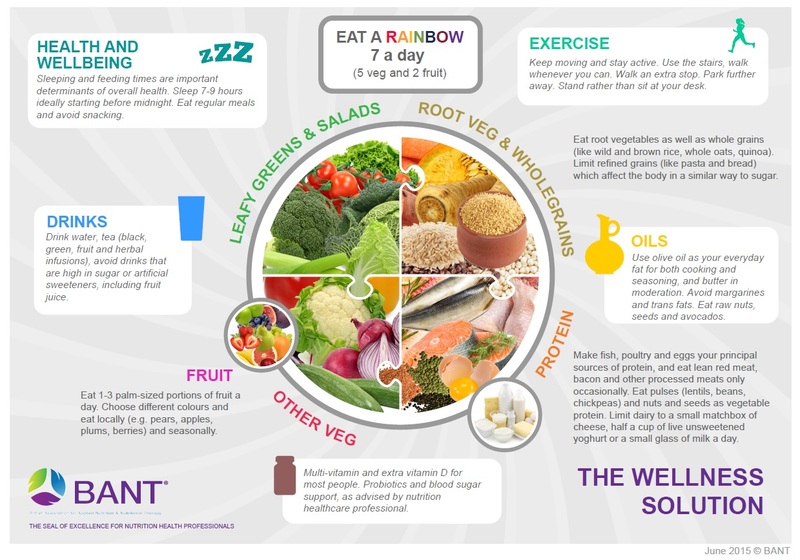 Here is one that is useful as a general guide for those wishing to optimise their nutritional status. Click on the image for a larger version. I see many people who suffer with constipation. This can have far reaching effects on your health. The stool is one of the body's ways of getting rid of waste, not just residue of food, but hormones, dead cells and bacteria, and the toxic by-products of medications and non-organic food. Many people don't even realise that they are constipated because their bowel movements have always been the same. Infrequent and hard to pass bowel movements are normal to them. Anyone who has consulted with me in clinic will know that we take a deep dive into your digestive tract as part of the detective process of finding out what is going on in there, using this as a window into other body systems. The state of your digestion could be the root cause of your ill-health, even if your symptoms and the health of your bowels feel unrelated. So how do you find out if your bowel movements are normal or not? There are many angles to this which I cover in detail during a consultation. I usually start by looking at the Bristol Stool Chart, shown below. Have a look and see where you are on the scale. Get things moving - Try out these tricks! Stewed Bramley apple with cinnamon and raisins. Make a large batch of this (don't add any sugar, the cinnamon and raisins will add some sweetness) and keep it in the fridge. Every morning, 1/2 an hour before you have your breakfast, have 3-4 tablespoons of stewed apple along with a large glass of luke warm water. Try this every day for at least a week. If it works for you, that's great - you probably don't need to carry on doing this every day and can also be more flexible in the ways you eat it - delicious as a base for some yoghurt and granola for a filling breakfast for example. Eat 2 kiwis first thing in the morning 1/2 an hour before breakfast. Drink a large glass of luke warm water at the same time. Do this every day for at least a week and see if it has the desired effect. If so, drop down to 1 kiwi daily and then 1 every other day. Once you've got things moving on a regular basis, just add a few kiwis into your weekly routine to keep your digestion happy. Add 2-3 tablespoons of flaxseed into your morning routine. Start with 1 tbsp and work up to 2-3 over a few weeks. You can have flaxseed in a number of different ways and it is worth experimenting to find the way that works best for you. Either, lightly crack the whole seeds and leave to soak in a little water overnight in a bowl. In the morning, you will notice that the seeds have cracked open a little more and formed a sticky gel-like liquid. You can either scoop this back with a large glass of water, although the mouth feel can be a little unpleasant! Alternatively, mix into some porridge or a smoothie. With all the lovely sunshine we are having at the moment, we should be storing up lots of Vitamin D. Some people are unable to successfully convert much of the sunshine into useable Vitamin D however because of their genetic profile, whilst others dislike the heat and hug the shade instead. Low Vitamin D levels are implicated in many chronic pain conditions. It is easy to test for and simple to optimise, with either safe sun exposure or appropriate levels of supplementation. Ask your GP if they will test your levels or contact Clare for a simple home-administered test kit. You can read the full study on BANT's Nutrition Evidence database by clicking here. It is open access and free.